Quick Daily Look..... - SEM PUBLIC SCHOOLS HOME OF THE MUSTANGS! John Baylor "On To College"
Seniors: The Independent Cattlemen of Nebraska (I.C.O.N. ), offers an annual $500.00 Memorial Scholarship for graduating high school seniors who will be going to college the upcoming fall after graduation. This scholarship is open to children and grandchildren of I.C.O.N. members and the application deadline this year is May 11th. This Scholarship is in memory of Jim Hanna, our organization’s founding directors. You can learn more about Mr. Hanna on our website, www.IndependentCattlemen.com. Scholarship form for qualifications as well as the deadline and distribution for the award in file below. Seniors: Here is a link for the Nebraska Cooperative Council Education Foundation (NCCEF) Michal S. Turner Scholarship that looks very attractive for several of you. Kicker is the scholarship is due next Monday, April 15. Check it out and see if you are interested. Good luck. Several local scholarships are due by the end of today. Make sure you get them turned into the counseling office. Thank you. Seniors: Several LOCAL and Regional scholarships are due next Monday, April 1. Get them turned into the appropriate person. Don't wait until the last minute to turn them in. **Seniors: Many of your scholarships will be coming due on April 1st through April 15th. Please make sure to set up a schedule to help complete the scholarships in a timely manner. Southeast Community College Automotive Summer Camp is an excellent opportunity to see the latest technology used in the transportation industries, experience hands-on activities and see what college life is all about. At Automotive Summer Camp you will meet and work with SCC instructors. All participants will need to provide a signed waiver to participate in the event. For those under the age of 19, a parent or guardian will need to sign the waiver. Download and print the waiver. Participants are strongly encouraged to submit the waiver prior to the event. Signed waivers can be emailed to Kevin Uhler, Program Director, at kuhler@southeast.edu or faxed to 402-761-2324. THERE IS NO COST FOR THE CAMP!! ​The Fort Kearney Conference Scholarship deadline has been extended to this Friday, March 22. Central Community College will be offering a SUMMER SCHOLARSHIP for current juniors and seniors. Please see Mr. Doud for an application. Deadline is April 15. Seniors keep working on those scholarship applications! Seventh Grade College visit to UNK and Kearney Central Community College. Senior students living in Buffalo County: Check out the Kearney Area Community Scholarship link for scholarship options. Beattie Family Farms Agriculture Scholarship has been updated and is now listed on the local scholarships. The application is due April 15, 2019. No School today due to icy and snow packed roads. 10:00 late start due to icy roads. Sophomores will be on a college visit to Wayne State College and Northeast Community College with Mr. Doud on Monday, February 25. Students will leave at 6:00 am and return around 6:30 pm. Students will need to have an assignment sheet completed prior too leaving. Freshman will be on a college visit to Hastings College and Hastings Central Community College with Mr. Doud on Tuesday, February 26. Students will leave at 8:00 am and return around 4:30 pm. Students will need to have an assignment sheet completed prior too leaving. 8th graders will be on a college visit to Concordia University and Southeast Community College in Milford with Mr. Doud on Wednesday, February 27. Students will leave at 7:40 am and return around 4:00 pm. Students will need to have an assignment sheet completed prior too leaving. No School today-icy roads. Great day for seniors to work on scholarships. The Kearney Area Community Foundation is proud to announce a new scholarship. The Arthur E. Klinkacek Promise Scholarship provides incentive for deserving graduating high school seniors who demonstrate significant potential for success, but are limited by both academic performance and lack of financial resources. To be eligible, the student must be a resident of Buffalo County, Nebraska, or attend (or have attended) a Buffalo County high school. This year, four $10,000 scholarships will be awarded in the Buffalo County area . See Mr. Doud if you have questions about the scholarship! Seniors: Keep working on your scholarship applications! If you need assistance come see Mr. Doud! I am sure you are budgeting your time each day to complete scholarships. Keep checking the web page for new scholarship! Just set a visit with Abel from UNL for March 18 over our lunch time. Put the date in your planner. Thanks to SSG. Rivera and the Army National Guard for serving our seniors pizza and pop for lunch yesterday! Juniors and Seniors are invited to a pizza lunch with SSG.Rivera and the Army National Guard today. Congratulations to both Sarah Glatter and Sidney Ripp for interviewing for the Girls State. Will share our representative and alternate as soon as I find out! Nice job! Students in 9-11 grades: Dawson PPD is looking for applicants for the Youth Energy Leadership Camp. This camp is for students interested in a STEM career. The goal of the camp is to expose students to the career possibilities within the electrical utility industry. Although our line workers make up a majority of what people see/associate electrical utilities with, it is more than that. The industry also employs electrical engineers, accountants, biologists and more. All fees associated with the camp will be covered by Dawson PPD. Students who reside within Dawson PPD’s territory are eligible. 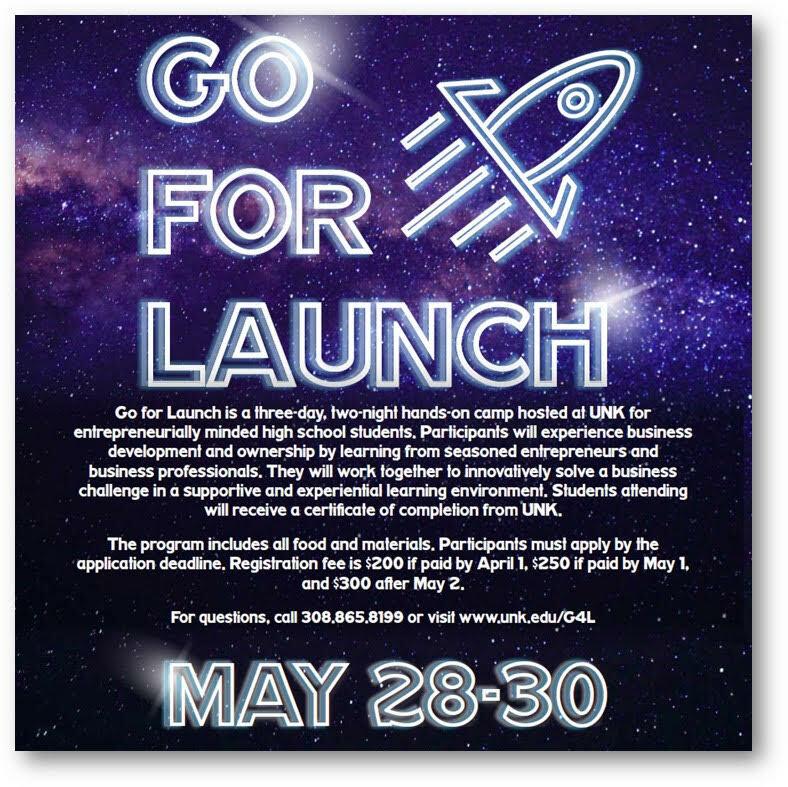 Interested students can visit the website for details and apply: The application deadline is April 26. See Mr. Doud if you have questions. Girls State interviews for those that turned in applications are today. If you are 18 and looking for employment, check out Simon at their website The company resurfaces asphalt bridges and will be in Lexington the next two years. 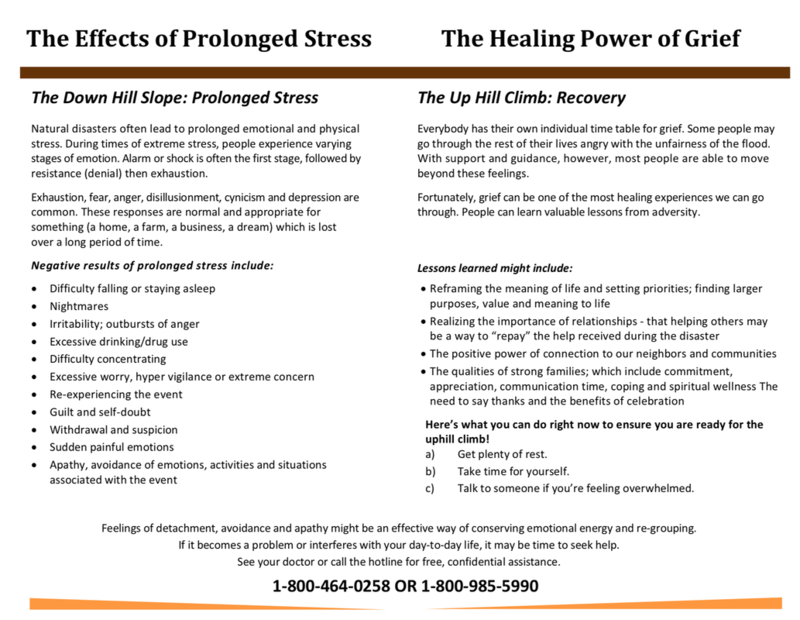 Excellent benefits, opportunity for advancement and time and a half after 40 hours. Starting wages are $16 an hour. There is also a “Explore Careers” box at top of the page. This LINK will take you directly to the job application. Girls and Boys applications are due today. The Mike Rowe Works Foundation (Mike Rowe was the host of Dirty Jobs) is offering scholarship funding for a handful of trade programs. Scholarship details are available on the program website The application deadline is March 28, 2019. UNL will be hosting a CASNR Power of Red spring open house for the College of Agricultural Sciences and Natural Resources on Wednesday, February 13 from 8:30 am – 12:30 pm. With 30 diverse majors and a pre-professional program, CASNR creates an educational experience that positions students to have a lasting and impactful career that aligns with their passion. During the event, attendees will meet faculty, staff and current students to get the scoop on what life in CASNR is really like. Experience the Power of Red Visit Day will not only expose potential students to their academic future, but also the unique living-learning spaces on campus. The visit day will begin at 8:30 a.m. with students getting a brief introduction to each department in the college. Following a welcome at 9:15 a.m., students and parents will attend academic sessions that offer more in-depth information about each academic program. The event concludes with lunch and a scholarship drawing at 11:45 a.m. Optional tours of City Campus and East Campus will begin at 12:00 p.m. Advance registration is required by February 6. To register and to see the complete schedule for the day, visit https://casnr.unl.edu/visitday. Students to Ft. Hayes University. Junior Girls: Please see Mr. Doud about the DISTINGUISHED YOUNG WOMAN SCHOLARSHIP. Register/apply online and for more information at www.distinguishedyw.org. 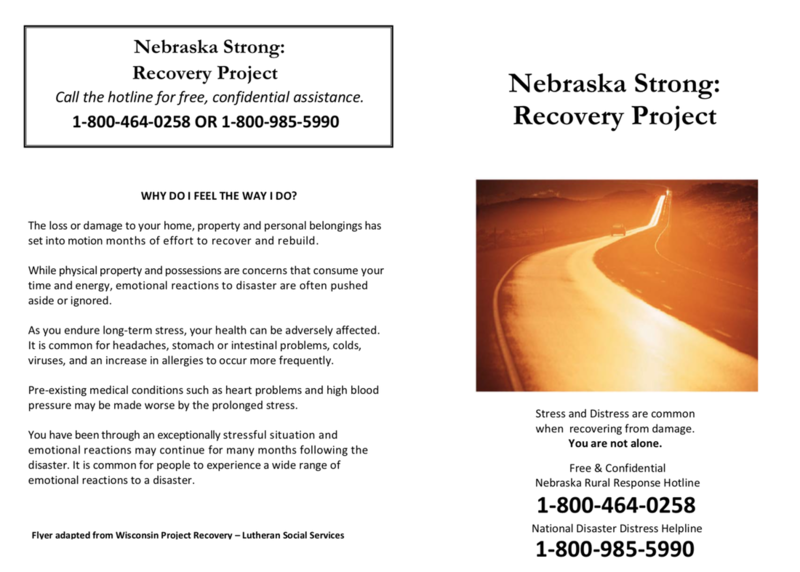 The deadline for students in the Central Nebraska area to apply is February 24, 2019. All Juniors are taking the ACT today. Get your dual credit registration forms from CCC to Mr. Doud by the end of the week. Students interested in dual credit classes need to see Mr. Doud. Pick up your registration forms for the second semester and get them turned in ASAP. Daughters of the American Revolution(DAR) Scholarships provide the means to help students receive a higher education. Scholarships are now available in the areas of history, political science, government, economics, business, nursing, occupational/physical therapy, medical, law, English, science, math, chemistry, music, horticulture, elementary and secondary teaching. All 26-scholarship applications are submitted electronically via e-mail to the National Vice Chairman in charge of the specific scholarship. The email address for each scholarship is located on public websites and on the top of each of the scholarship’s application form. Mr. Doud will have a presentation during lunch on Monday, November 12 on strategies for the Susan Buffett Foundation Scholarship. We will discuss the importance of your essay, recommendation letters, who should write your recommendation letter, checklist, key dates, and much more. Bring your chrome book and lunch. Great visit for our sophomores and juniors to the Lexington Career Fair this morning! Mr. Doud will be taking any junior or senior interested in visiting Southeast Community College and UNL on Friday, November 16. Student must sign up in Mr. Doud's office by Friday, November 9th to be able to go. More details will be shared after Friday deadline to sign up. Sophomores and juniors will be attending the November 6 Lexington Career Fair. Deadline for ACT is quickly approaching, make sure you get registered if you plan on taking it in December. The marine representative will be at SEM on November 5 during lunch. Seniors: Today is the first day you can apply for the FAFSA. Complete it yourself or set up an appointment at Education Quest in Kearney. The NHS (National Honor Society) Scholarship The National Honor Society (NHS) is the oldest and best-known student recognition program. For nearly 100 years, NHS members have been making a difference in their schools and communities through their scholarship, service, leadership, and character. Alumni include celebrated individuals from all walks of life, including the arts and sciences, government, education, medicine, the military, politics, and athletics. To recognize the most outstanding NHS members, the organization has been awarding its respected NHS Scholarship to hundreds of students every year-helping make their higher education aspirations more affordable. See Mrs. Jones for an application. Opens October 1 and will close December 7, 2018. The Associated Staffing Skilled Trades Scholarship scholarship is a new scholarship for graduating high school seniors pursuing a certificate, diploma, or associate’s degree in a skilled trade field of study from an accredited institution of higher education located in the state of Nebraska. Scholarships will be awarded to graduating high school seniors residing within the Associated Staffing office. The scholarship application period opens December 1, 2018 and the completed application and references must be submitted and received on-line by February 1, 2019 through the link on the Grand Island Community Foundation Website. Here is an article for fall timeline options for high school seniors. 12 excellent reasons to add a resume to your college application toolbox. ​Chadron State College will be hosting their Annual Health Professions Showcase. The registration deadline is September 24th. This is a great event for students interested in RHOP or Health Professions. ​Chadron State College Annual Health Professions Showcase registration link Both the showcase and lunch are free!! Reminder that a UNK representative will be here on Thursday, September 20 over your lunch. Make arrangements to talk to Grant. Central Community College Dental Days: Monday, September 17, Friday, October 26, and Friday, November 9. Call or email admissions if you wold like to sign up for one of these events at 402-461-2428 or admissions@cccneb.edu. The importance of building a good resume value-added in the application process. Central Community College in Hastings will be hosting a Diesel Career Fair October 4 starting at 9:30. 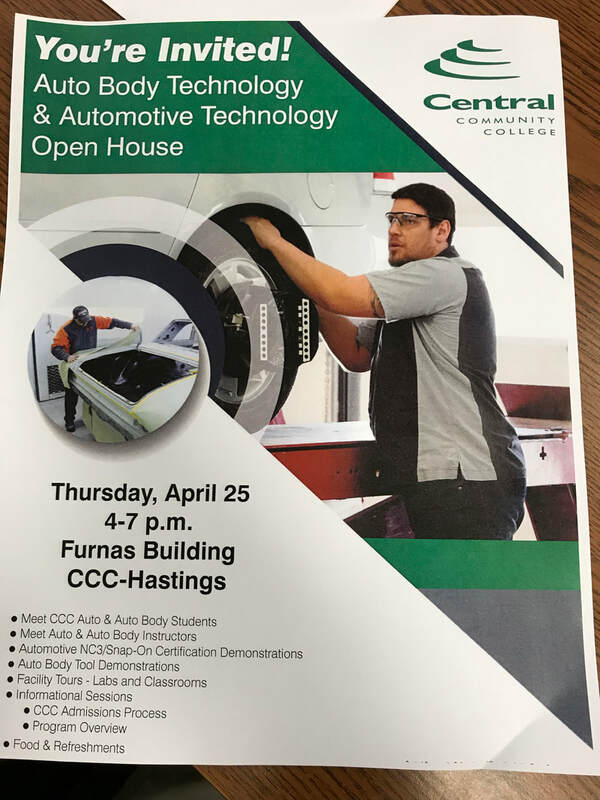 If you have questions call or email Jeff Bexten at 402-461-2563 or jbexten@cccneb.edu There is a flyer in Mr. Doud's office. If you are planning on going to the career fair in Lincoln with Mr. Doud, please get your paperwork turned in by Thursday. Check out the John Baylor video clips. A lot of information in a quick take! ​The Scholarship Guidance for students web page for national scholarships and additional helpful information. Make sure to check out Scholarshipquest@educationquest.org for additional scholarship opportunities! Get the Social Scholarship by following on FaceBook and Twitter and the Scavenger Hunt Scholarship by completing a scavenger hunt. Two easy ways to get into a drawing for scholarships! Thanks to all the parents and students that attended the Financial Planning Night! Financial Aid Night at 7:00 today! Great message from Education Quest for junior and senior students and parents! Everyone is welcome! A Central Community College representative will be here on October 12 over lunch to visit with any interested students. College Day at SEM! Ask your teachers about their college days! Seniors: Great job today participating in the Apply2College at SEM day! We had 12 seniors apply to 36 schools and complete the Federal Student Aid ID (FSA) used to complete the FAFSA! Check out the Picture the Moment for pictures! Do you have strong math and science skills? Do you like technology, medicine, construction, chemistry, physics or want to impact the world? The University of Nebraska College of Engineering and University of Nebraska Kearney are excited to partner with Eaton Industries and the City of Kearney to host a unique event for students. Rural Engineering Day (RED) Event will be hosted on Tuesday, October 23, 2018 from 9am-2pm. This is a chance for students from smaller schools in the region to learn about the opportunities within Nebraska Engineering and discover how they can start preparing for an engineering major while still in high school. Presentations will be given on academic preparedness, majors and minors, careers in the industry and how engineering is impacting lives in Central Nebraska—including tours of our host facilities at Eaton Industries and the City of Kearney. Lunch is also included, there is no cost to register. This event is geared towards Sophomore and Junior students, but you can bring any interested students. Tuesday, October 23, 2018 9am-2pm Kearney NE (meeting location will be assigned once registration closes) Registration will close on October 14, 2018 OR earlier if capacity is reached for this event. Contact Nicole Franta, Assistant Director of Recruitment, at nicole.franta@unl.edu with any questions. A representative from Chadron State College will be here October 24 during lunch to visit with anyone interested in learning more about CSC. The first three students that read this announce need to come to Mr. Doud's office for a surprise! ​A college representative from Nebraska Wesleyan will be here on Tuesday, September 4 during 1st period. SEM will be celebrating COLLEGE DAY on Wednesday, September 5. Teachers will be wearing shirts from their alma mater (school they graduated from) and can share some of their stories from college. There will also be college trivia throughout the day. Seniors…3 must-do tasks for this fall! Apply to your top college choices. Create an FSA ID. You and a parent must each create a username and password at fsaid.ed.gov that will serve as your Federal Student Aid (FSA) IDs for the Free Application for Federal Student Aid (FAFSA). You will each need your own email address to create an FSA ID. Students will complete their FSA (Federal Student Aid ID at SEM’s Apply2College on September 4th. FAFSA Application - October 1, students and their parents can complete the 2019-2020 FAFSA (Free Application for Federal Student Aid). The FAFSA is the application for state, federal, and college-based financial aid. Mr. Doud can help assist getting started with the FAFSA but it is highly encouraged to set an appointment with the Kearney Education Quest group to complete the FAFSA. Apply2College Day will be September 4th for ALL seniors. 2nd period will be used to apply to colleges, complete the FSA ID (Federal Student ID) and learn more about the FAFSA along with other great activities! We will also be celebrating COLLEGE DAY with all SEM students on September 5th! SEM will be hosting an Education Quest Financial Aid Program on Thursday, September 6 at 7:00 p.m. The hour-long presentation will discuss college admission, types of financial aid, scholarships and FAFSA (Free Application for Federal Student Aid). Students/parents attending the financial aid night will earn a chance to win a $500 scholarship. This program is strongly suggested for junior and senior parents/students but anyone is welcome. Snacks and drinks will be available. Juniors: ASVAB Career Exploration Program - All juniors will be taking the ASVAB on September 14. The ASVAB is an exciting opportunity to explore all your career and post-secondary options and fine the one that works for you. The ASVAB’s career exploration helps students identify skills and interests and encourage you to explore all the pathways you can take to reach your career goals. PLEASE MAKE SURE TO BRING YOUR CHROME BOOKS FOR THE MORNING. Education Quest will be hosting a College Fair in Lincoln on Sunday, September 16 from 1:00-3:00 p.m. SEM will be providing a bus for students interested in attending. Please sign up with Mr. Doud or in the front office by Thursday, September 13 if you are interested. You will need to complete a parent permission note to attend. The bus will leave at 10:00 a.m. and return roughly around 6:00 p.m. There is also a College Fair in Omaha on September 23 from 1:00-4:00 p.m. but NO bus will be provided. Visit NebraskaCollegeFairs.org to register for a barcode. Print the barcode, or save it to your smartphone, and take it to the fair so college reps can scan your demographic information. Arrive early enough to visit all colleges that interest you. Stop by the Education Quest booth to get free college planning materials and for a bag to collect college view books. What are admission requirements and deadlines? Does the school offer academic programs that meet my interests? What is the cost of tuition and fees — and room and board? How do I apply for college-based scholarships? I am excited to share with our SEM families that we were awarded a $10,00 Education Quest College Access grant over the next four years. The grant will provide our students an opportunity to visit Nebraska colleges, share activities to better inform and empower our students with choices after graduation and enhance our college-going culture! Scholarship opportunities from Beauty Changes Lives helping provide students the financial freedom to pursue a career in beauty and wellness. Fall Scholarships start August 1st through September 15th. They are awarding over $125,000 in scholarships to 26 students and professionals. Senior's last week of high school! Fort Kearney Conference Scholarship is due by noon on Friday if you are interested! ​Seniors: Please complete the scholarship form that I shared with you through the email. I also need a senior picture for the Beacon Observer. Seniors: Please complete the scholarship form that I shared with you through the email. I also need a senior picture for the Beacon Observer. JUNIORS: Juniors will be taking the ACT on Tuesday, April 3 at the Sumner Community Hall. Breakfast will be served at 7:30 and the test will begin at promptly at 8:00 a.m. 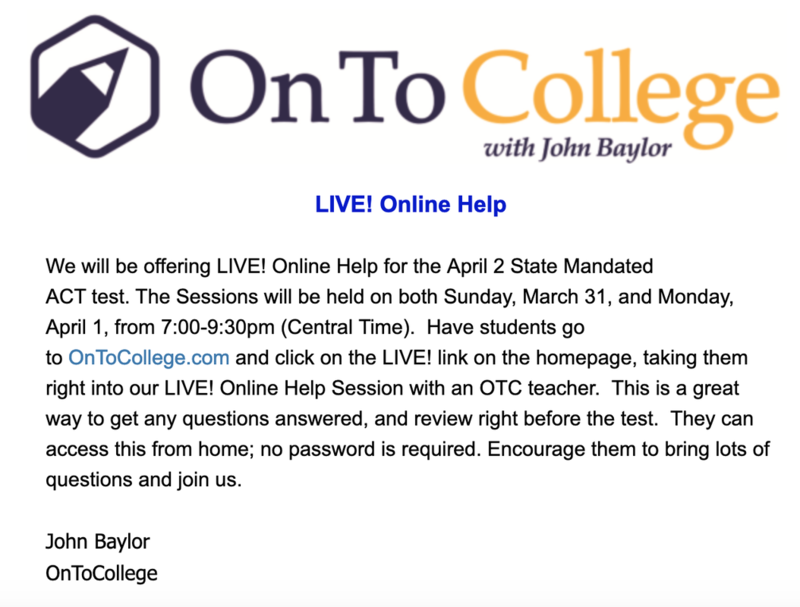 Please make sure to use your study guide options from John Baylor and the online discussion on Friday, March 30. See Mr. Doud if you have questions! Seniors: A reminder that several local and regional scholarships will be due April 1. I will need them turned into me by the end of the school day on Thursday, March 29. Check out the information for the Oxbow Vet Camp. You must be 16 or older. 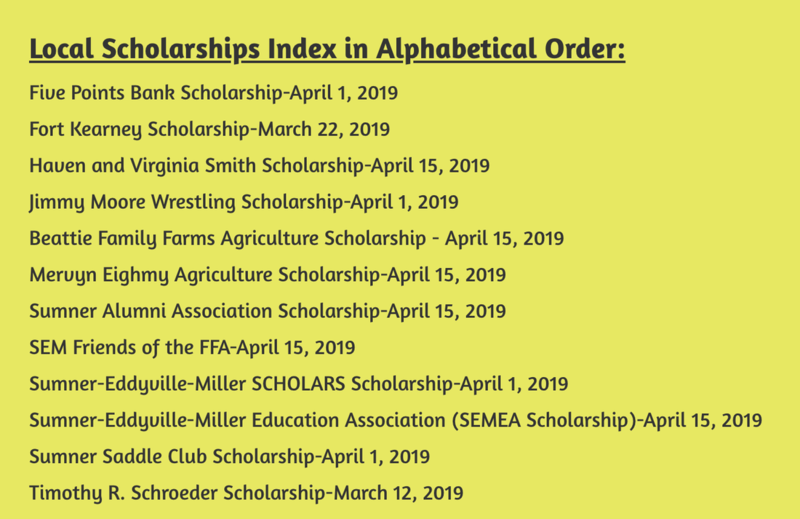 The deadline for the Miller Auxiliary scholarship has extended until Thursday, March 22 until 4:00. Please turn into Mr. Doud. SENIORS: Several scholarship are coming due now or very soon. Make sure you have a time table for completing your scholarships. Here is a great video to check out on choosing colleges. 8 Questions for Choosing Your College. Scholarships are starting to come due! Use your time wisely seniors and keep focused on the prize! If you haven’t already, complete a profile in ScholarshipQuest at EducationQuest.org. ScholarshipQuest is a scholarship search tool with over 2,000 Nebraska-based awards. If you’re a Nebraska resident in grades 9-12, you’ll see the EducationQuest Scavenger Hunt Scholarship as one of the scholarships you’re eligible to apply for. “Scavenge” around the EducationQuest website to find answers to questions in a survey. EducationQuest will draw a winner from those who answer all questions correctly. The winner will receive $500 to invest in a NEST 529 College Savings Plan account. ​Juniors and Seniors: Central Community College is offering a Summer Scholarship. Deadline is April 15, 2018. Students 16 and older: Southeast Community College will be hosting their Automotive Summer Camp June 8-9. Spaces will fill up fast! See Mr. Doud for information and the application. Mid-Nebraska Community Foundation has several scholarship applications. Applications are Due February 27, 2018. Scholarships can be located on the Regional Scholarships page. SENIORS: Are you keeping up with completing your scholarship applications? You are in the height of the scholarship season. You effort now will save you $$$$ next fall. Keep checking for new scholarship applications on Doud's Counseling Corner. Several new scholarships have been updated so don't miss out! Southeast Community College will be having their Discovery Days. These visits provide you an opportunity to experience SCC first-hand and discover for yourself what students and alumni love about Southeast Community College! During SCC Discovery Days, students will receive answers to their questions about a variety of topics, including our Programs of Study, how to pay for college, support services, housing, and activities. A campus tour is also included. There is no cost to attend, and lunch is provided. All events begin at 9:30 am and conclude by 1:30 pm. Children of Marines and Navy Corpsmen: Our scholarship application is open year-round for students pursuing career and technical education programs less than 12 months in length. For programs longer than 12 months, our application is open from January 1 to March 1 each year. A representative from North Central Kansas Technical College will be visiting on Thursday, February 8 during lunch, 11:30 along with the representative from Central Community College. Check them out and see what your options might be. ​Happy Ground Hog Day! He saw his shadow so we have six more weeks of winter! A representative from Peru State College will be visiting SEM on Thursday, March 8 at 8:00. This is a first time visit with Peru State and a good opportunity for juniors and seniors still looking at options. Central Community College Online Tutoring for Students Enrolled in Dual Credit College Courses-Students can now access Online Tutoring through WebCentral > My Courses > AVOR 1000. They will see the Online Tutoring Icon at the top of that page. If they click the icon, they will have choices and directions for writing assistance, math tutoring, and general academic tutoring. For questions, please contact Krynn Larsen, Academic Success Center Director at 402-562-1422or klarsen@cccneb.edu. Thank you. ​Take this time to get busy with your scholarships! Two hours of work could save you $2000.00 and more in college expenses. Several scholarships have been added. Great Plains Communication/Mitchell Technical Institute-Workforce Recruitment Program - Great Plains Communication has teamed up with Mitchell Technical Institute in Mitchell, South Dakota to offer selected candidates an opportunity to receive partial paid tuition by participating in the school's Workforce Recruitment Program. Students apply for a partnership with Great Plains Communications telecommunications program. In return, the students agrees to work for Great Plains Communication after graduation. A limited number of opportunities are available. For more information visit Mitchell Technical Institute. Check out the videos from NCK Tech for students interested in a technical education. A representative from Central Community College will be here on February 8. Please make arrangements with your teachers if you would like to visit. SENIORS: THIS IS SCHOLARSHIP SEASON, GET YOUR APPLICATIONS COMPLETED AND TURNED IN! Check and double check for scholarship applications with the school you have been accepted to attend next fall. 2018 Attorney General's Youth Conference - Tuesday, April 10, 2018 from 9:30-4:00 What is the Attorney General’s Youth Conference? On April 10, 2018, Attorney General Peterson will host a day-long conference where a selected number of high school juniors from across the state will have the opportunity to participate in discussion and debate. Topics will range from our U.S. Constitution, rights, responsibilities, and critical issues facing students and their communities. Students will also hear from AGO Bureau Chiefs, expand their understanding of the legal process in Nebraska, and eat lunch at the Governor’s Residence How can you apply? Juniors must submit an application and be selected to be able to attend the conference. Applications are due to our office on or before January 31, 2018. Selected students will be notified by February 28, 2018. *Dawson County Farm Bureau Scholarship - Due in May - I have been in contact with the person in charge and they have not sent out the 2017-2018 application. *Buffalo County Farm Bureau Scholarship - Due mid April. They have not sent the application to me yet. They are sending it to me in February. *Gateway/Kearney Farm Expo Scholarship - I am tracking information about application and deadlines. Watch for updates on this scholarship. *Calela's Women in Leadership Scholarship - I spoke to the corporate office and with the merger of Cabel's and Bass Pro, the scholarship application and date have not been set and will be at a later date. I will post when I receive information.